Egypt Court Sentences 21 To Death In Football Disaster Trial - kaycee Weezy! Egyptian fans clashING with riot police following THE Al-Ahly club soccer match against Al-Masry club in Port Said, Egypt, on February 1, 2012. An Egyptian court sentenced to death 21 people found guilty of involvement in the Port Said soccer stadium disaster in which 74 people died last year. As the verdict was read out in a court in Cairo on Saturday morning, families of those who were killed who were in the public gallery wailed in disbelief and relief and shouted "God is great!" Following the ruling, two policemen were shot dead when relatives tried to break into the Port Said prison to free the 73 defendants in the case held there, according to officials. At least 75 others were wounded in the violence. While there has long been bad blood between the two rival teams, many blamed police for failing to perform usual searches for weapons at the stadium. Fans of al-Ahly, whose stands were attacked by rival club Al-Masry in the Feb. 1 incident in the Mediterranean city of Port Said, had promised more violence if the accused did not receive death sentences. The soccer fans, known as Ultras, are among Egypt's rowdiest and are proud of their hatred for the police, who were the backbone of Mubarak's authoritarian rule. The Ultras then directed their chants against the military rulers who took over after Mubarak's ouster in 2011 until Morsi came to power in electi ons last June. When the verdict was read out in court, one man fainted, while others wailed and cried in disbelief as they carried pictures of the young men killed in the soccer riot. Judge Sobhi Abdel-Maguid said in his statement read live on state TV that he would announce the verdict for the remaining 52 defendants on March 9. Among those on trial are nine security officials. As is customary in Egypt, the death sentences will be sent to the nation's top religious authority, the Grand Mufti, for approval, though the court has final say on the matter. All of the defendants - who were not present in the courtroom Saturday for security reasons - have the right to appeal the verdict. 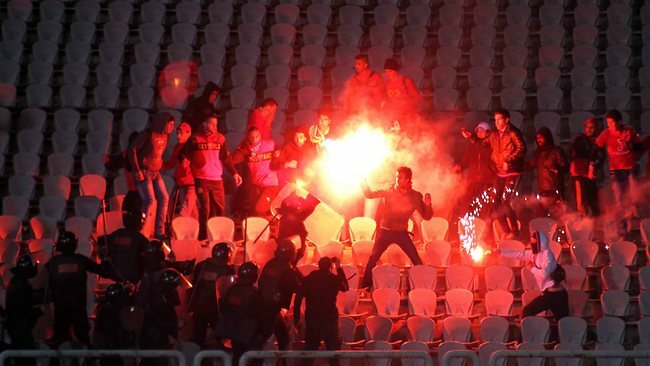 Many Ultras have taken a leading role in protests over the past two years. Both Al-Ahly Ultras and Al-Masry Ultras widely believe that ex-members of the ousted regime of Hosni Mubarak helped instigate the attack, and that the police at the very least were responsible for gross negligence. 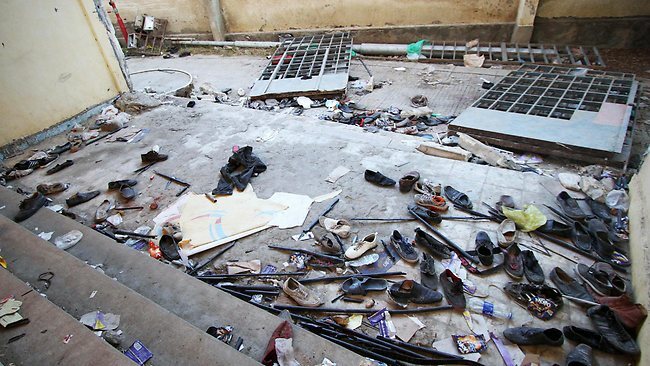 It is not clear what kind of evidence, if any, was presented to the court to back up claims that the attack had been orchestrated by regime officials. The melee was the world's deadliest soccer violence in 15 years. In the days leading up to the verdict, Al-Ahly fans warned of bloodshed and "retribution" if death sentences were not handed down. Hundreds of Al-Ahly fans gathered outside the Cairo sports club in anticipation of the verdict, chanting against the police and the government. "The police are thugs!" yelled relatives of the deceased inside the courtroom before the judge took the bench. The violence began after the Port Said home team won the Feb. 1 match, 3-1. Al-Masry fans stormed the pitch after the game ended, attacking Cairo's Al-Ahly fans. Authorities shut off the stadium lights, plunging it into darkness. In the exit corridor, the fleeing crowd pressed against a chained gate until it broke open. Many were crushed under the crowd of people trying to flee. Survivors of the riot described a nightmarish scene in the stadium. Police stood by doing nothing, they said, as fans of Al-Masry attacked supporters of the top Cairo club stabbing them and throwing them off bleachers. Al-Ahly survivors said supporters of Al-Masry carved the words "Port Said" into their bodies and undressed them while beating them with iron bars. The Ultras from Egypt's sports clubs were engaged in deadly clashes with police near the Interior Ministry headquarters in Cairo that killed 42 people less than three months before the soccer melee in Port Said.